No, not the title that’s been the bookie’s favo urite and had oodles of critical acclaim with one or two notable exceptions (I talk of course of A Little Life by Hanya Yanagihara). Nope. 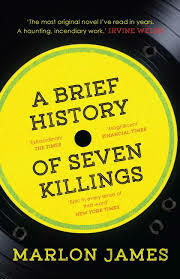 The winner of the 2015 Man Booker Prize announced tonight is the Jamaican writer Marlon James with A Brief History of Seven Killings. He becomes the first writer from Jamaica to win the award, thus demonstrating despite fears that the Booker was selling out to the Americans, that it is still carrying the torch for Commonwealth writers. James was apparently the unanimous choice of the judges who reached their decision in just two hours. They called the novel “the most exciting” book on the shortlist and “full of surprises”. Inevitably the choice will not be welcomed universally – some readers will be disconcerted by the fact it has more than 70 characters, makes liberal use of Jamaican slang and profanities and a stop-start structure. I’ve not read it – yet – and I suspect I’ll find it tough going just to keep up with all those characters and three decades of the turbulent world of Jamaican gangster life and politics. But I’m delighted the Booker didn’t settle for a safe option as the best novel of the year. I should learn from this experience two things however : 1. don’t embark on reading the shortlist thinking that by doing so there’s a fair chance I might be reading the winner 2. don’t rely on me to pick the winner. I fail every time. Posted on October 13, 2015, in Authors from.... and tagged Man, Marlon James. Bookmark the permalink. 21 Comments. He would certainly have given the impression he was on top of the latest big thing. maybe he’ll listen to you next year Kate! He may be Jamaican but he is living and working as a professor in St Paul Minnesota. There was quite a bit of cheering for the “local” who won the Booker when it was announced. I have not read the book but will probably get around to it one of these days though it will probably be hard to get it from the library for a while! I’m so pleased this won! I’m historically terrible at guessing prizes, so I was trying not to get my hopes up, but I thought it was utterly superb. Hope you enjoy it as much as I did! I love the premise of this novel but it does sound a bit tough and it’s not a small book either. My book group will be reading it in November, so I suppose I should try it. Yeah it’s quite a big, different pick. Wow congrats to Marlon James. I’m interested in the whole Bob Marley aspect of his story. I will likely try the novel from a library copy. it won’t be for everyone but yes I like the idea that they went out on a limb. I ‘m happy that Marlon James won, and I’m especially happy that he’s the first Jamaican person to do so. This book has so much praise surrounding it, that I think it’s unfair to not at least give it chance. I’m glad that it gives us a peek into the reality of living in Jamaica throught the use of language, I mean books are pushing boundaries right? Looking forward to reading this :). I have not read this book and I am not sure if I will, but I am very pleased to see a Commonwealth writer take the prize again with a challenging book that sounds like a very original and intense read. Keeps my faith in the Booker. I can’t believe I actually picked the winner. I did terribly with both the long list and short list predictions but I guess that makes up for it. I have not read this book (my co-blogger read it and liked it). I am looking forward to reading it. does that mean you picked it purely on your co blogger’s reaction and what else you’ve seen as commentary about the book? OR that you have sixth sense?? I have read excerpts, reviews, and had extensive discussions with my co-blogger about the book. I wish I had sixth sense. I didn’t think that A Little Life would win because of the flaws and I didn’t love The Fishermen or A Spool of Blue Thread. Everything I had heard of with regard to James’ book supported a win.